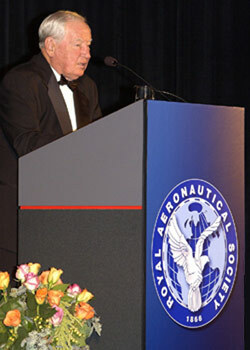 The RAeS Seattle Branch premier annual event is the Black Tie Dinner Lecture named in honor of Joe Sutter and it takes place in the Museum of Flight's Great Gallery, in or around the third week in November. We have been very fortunate in being able to attract speakers that our guests really want to hear because of their prominent leadership and contribution to aerospace accom­plish­ments. Our Black Tie Dinner Lectures have been given by Alan Mulally, former CEO, Boeing Commercial Airplanes, Joe Sutter, "Father of the 747", and Sir Ralph Robins, former CEO of Rolls-Royce, and many other such honored speakers.